Yes, I know, classes usually have a one in front of them, as in Quilting 101, not Quilting 001. But, we’re talking basic basics here. The simplest of simple. Quilting 001 will walk the fearful quilter into the quilt world maize one step at a time. Before long you’ll be walking around, not getting lost, but trying new things. So come along. Let’s make a quilt. First, the rules. Rules? What rules? We don’t need rules tangling us up. Right, we’re going to ignore most of the quilt rules. Shhh, don’t let the quilt police hear about this. However there are a few pointers that will make your foray into the quilt world more enjoyable. 1. Relax, this is your first quilt. Most likely it isn’t destined to become a heirloom quilt for your grandchild. No, this will be a simple wall hanging, lap quilt, or warm cover on your bed. Basically you’re making a blanket, relax and enjoy the process. 2. Remember that acronym KISS, keep it super simple? That’s a good plan for a first quilt. Keep the pattern and quilt simple. If you have to fight to get the curves right on a Drunkard’s Path, struggle to keep the points sharp on a star block, or spend more time unsewing than sewing, you’ll be tempted to throw the whole thing down in disgust and walk away from the joy of quilting. It’s your quilt, if you want to go with an intricate pattern, I’m certainly not going to stop you. For the rest of you, a quilt made with simple squares will work just fine. 3. No fancy equipment needed. Scissors to cut the fabric, or a rotary cutter and mat if you have one. Either works well. Pattern or instructions. You wouldn’t try driving in a strange town without a gps or map would you? Ok, I would and you might too. But, really, the gps, or quilt instructions make life much easier. Iron, and ironing board (or a folded towel on a cabinet works well too.) Nothing special, the iron you already own is perfect. Needle and thread or sewing machine and thread, your choice. Whichever works for you, again, it’s your quilt. Pins. Straight pins to hold your fabric together before you sew it and safety pins to hold all three layers together when you’re ready to quilt it. 4. Decide on your level of perfection. Some people (most) strive to have their quilt seams match up perfectly. They may have one “fault” in the quilt, one they purposely put in, but other than that their quilts look like works of perfection. I, on the other hand, am the Imperfect Improv quilter, I don’t care if my seams don’t match. Sometimes I go out of my way to make sure they don’t match by making a quilt with off-set seams. You may fall at either end of the spectrum, or somewhere in the middle. Decide what you can live with, and don’t worry about little mistakes that fall within your acceptability level. 5. Use fabric of similar weight and quality. This will help your quilt wears more evenly. 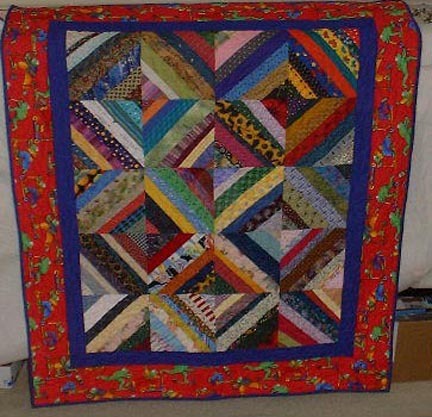 This entry was posted in Devoted to Quilting, quilt, sewing, tips, Tutotorial and tagged arts, books, clothing, devoted to quilting, diy, friends, Home, quilt, quilt class, quilt show, quilt top, quilter, quilters, quilting on July 3, 2013 by Nita. It’s Show and Tell Monday! Ok, it’s not, it’s just Monday. But, today is letter S for the A to Z challenge. Okay, it’s not even Monday, it’s Wednesday. The post was ready, except for a picture on Monday. Still no picture, but a post of words is better than nothing. Right? I’ve been a little (sometimes I am a master at understatement) behind on the blog challenges. Last week I almost forgot I had a blog, much less a couple of challenges. What in the world could make me forget something like my blog? A speech contest. Speech contest begins with “S”, so I’m good. Right? Sure, speech contest begins with “S,” but what does it have to do with quilts? Well, the speech was about a quilt. Sort of. In the speech I compared our lives to quilts. To further illustrate the point I made a “quilt” to use as a prop. I spent last week sewing, and speaking, giving practice speeches wherever and whenever possible including speaking to the dog. Poor baby. This week though, I’m back on track trying to accomplish too many things in too short of time. It was a fun week though. Too bad it didn’t end with a win. Oh well, there’s always the next contest. That was Monday. This is Wednesday. Shortly after writing that post and before I could take the picture of the quilt the stomach flu bug found and attacked me. No pictures, no posting, no writing. Just sick. Better now, and future posts will, with luck, appear on schedule. 🙂 Hope the “bugs” haven’t attacked anyone else. This entry was posted in A to Z, challenges, Devoted to Quilting, sewing and tagged arts, Blog, bloggers, devoted to quilting, friends, Home, illustration, photography, photos, pictures, quilt, quilter, quilters, quilting, sewing, writers, writing on April 24, 2013 by Nita. From A to Z Blog Challenge. I love magic. Even when I know how a magic trick is completed, they fascinate me. Not all television magic was fun. Miss Nancy’s magic mirror was a fake. I knew it then, because no matter how still I sat, or how hard I concentrated, her mirror never saw a “Nita.” It had to be fake, that’s all there was to it. What does all of this have to do with quilt? Simple really. 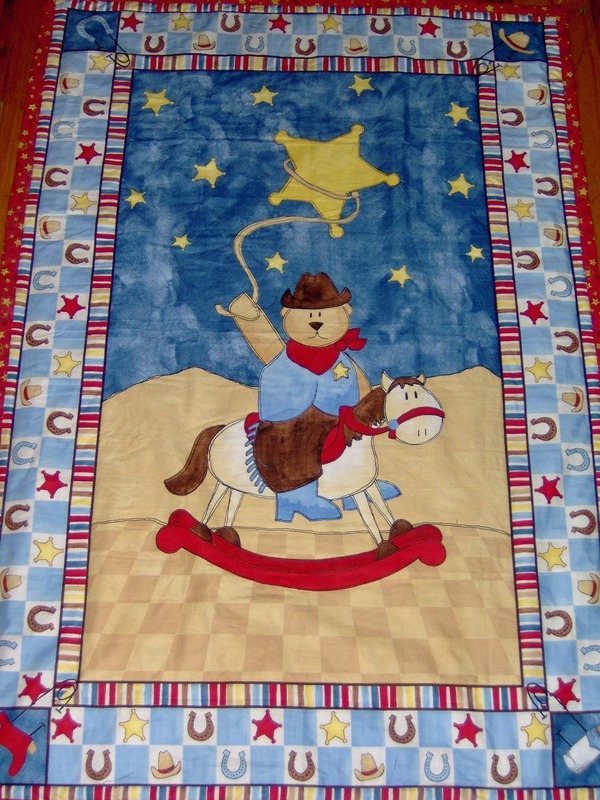 There are magic quilts. Quilts that start out one way and end up another. Quilts with a disappearing name, the disappearing nine patch, the disappearing four patch, even the disappearing sixteen patch. These start out as simple block quilts, a nine, four or sixteen patch. 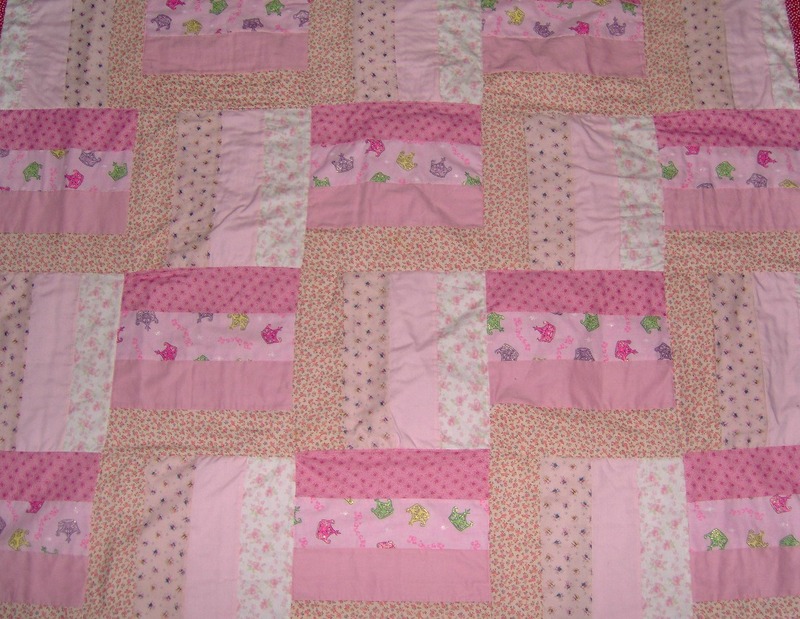 However, the end result looks nothing like a simple set of same – sized blocks sewn together. Then there is the magical healing qualities of a quilt and quilting. Designing, and/or sewing on a quilt calms cranky mommas, gives them a little time for themselves and is relaxing. Snuggling under a quilt when ill is comforting, and eases the pain somewhat. Sew days give us the magic of time with friends to sew, quilt and visit. Quilts are magical in so many ways. Do you have a magical quilt? This post is part of the A to Z blog challenge. This entry was posted in A to Z, Devoted to Quilting, family, friends and tagged arts, Blog, bloggers, creativity, family, friends, Home, quilt, quilter, quilters, quilting, television magic on April 16, 2013 by Nita. Quilt designs are varied, from organized chaos (now often referred to as “improv” quilts) to those with intricate designs and everything in between. This family quilt is a good example of organized chaos. Uniform sized blocks make up the quilt. 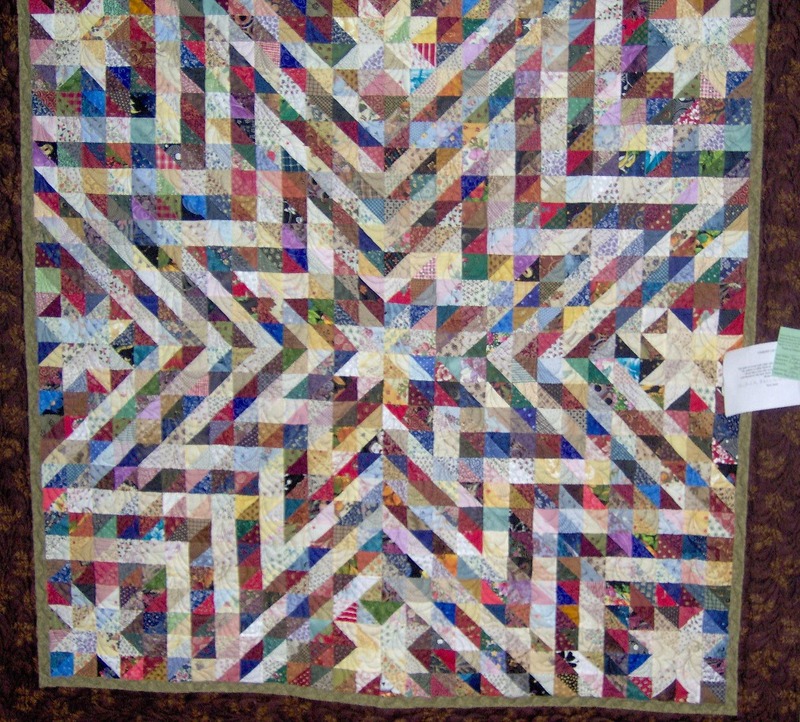 However, the blocks are compilation of fabric in various sizes and shapes, the quilters used available fabric, to make the blocks, giving it a very scrap look. Embroidered names, of family and friends, on the fabric swatches give added meaning to the quilt. The quilt, owned by a descendent of one of the quilters, is close to 100 years old. Here is a more planned friendship quilt. The quilters of the Piecemakers Quilt Guild of Eufaula Oklahoma made it a couple of years ago to honor their founding members. Quilt made by the Piece Makers Quilt Guild of Eufaula Oklahoma. 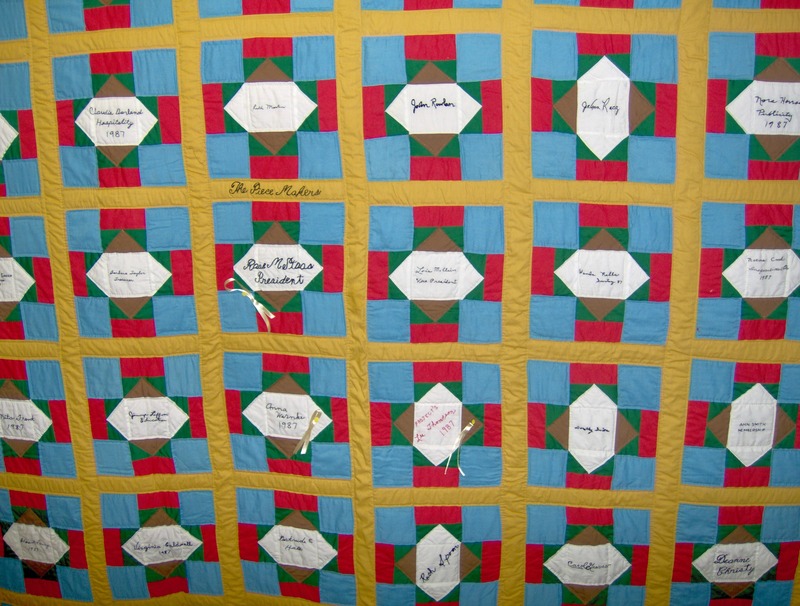 Friendship quilts like these were usually designed to honor someone, as the second one. We have no idea why the first quilt was made. It is a beautiful piece of history with our ancestors names on it. 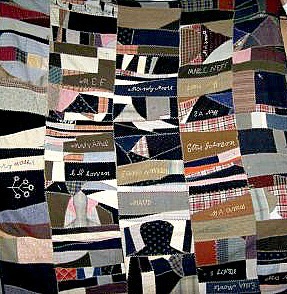 Often times women in the community made and designed a friendship quilt to welcome or send off a preacher or teacher. Here is another scrap quilt, this one designed to use the light and dark fabrics to form stars. It took careful planning, a precise stitching to get the large star which formed the smaller stars. I’m not sure who made this quilt, I took the picture at a quilt show. A little less intricate, and still using scraps are these versions of traditional designs. This first one is the rail fence design, or at least my version of it. It uses all pink fabric since I made it for my granddaughter. 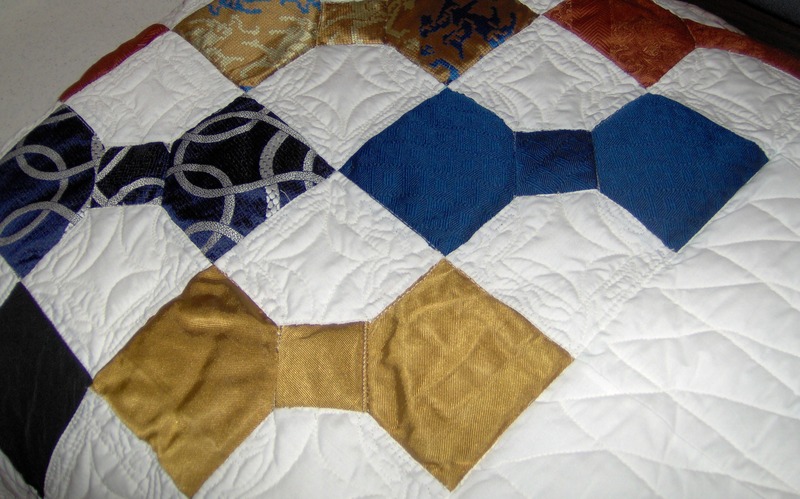 This second one is the traditional Bow Tie pattern, however the quilter used dimensional center for the bow, a more modern method for completing the design. Sometimes the color makes the design. 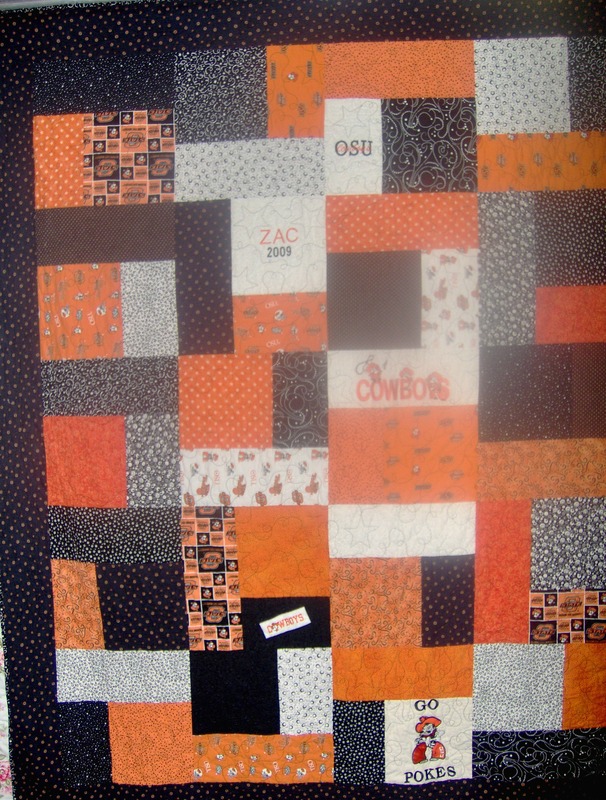 This quilt of simple squares and rectangles becomes special, with the use of orange, black, white, and Oklahoma State University prints. Made by an Oklahoma State Mom and displayed at the Stillwater Quilt Show in 2012. The final design today is a super simple one. It’s pre-printed on the fabric, often called a panel quilt. I only had to add the batting, backing, and binding. Although, I didn’t even add binding. Instead, I used the pillowcase method. These are just a few of the thousands of quilt designs available. Because, really, the design of the quilt isn’t limited. The quilter selects, and often changes, the design of the quilt. Do you have a favorite quilt design? Linking up with the A to Z challenge, and the Ultimate Blog Challenge. Both have some great bloggers linking up. Go read some of them, they’re great. This entry was posted in A to Z, challenges, Devoted to Quilting, quilt, Quilt Show and tagged arts, Blog, bloggers, devoted to quilting, family, friends, Home, photos, pictures, quilt, quilter, quilting, shopping, style on April 5, 2013 by Nita. November, turkey, quilts, thanks, they all go well together. My original idea had been to post daily about something I’m thankful to have in my life, or to have experienced. Since it’s already the fifth, and this is the first post of November, that obviously isn’t happening. I will endeavor to finish out the month posting about people, things, and happenings I’m thankful to have, or to have had, in my life. 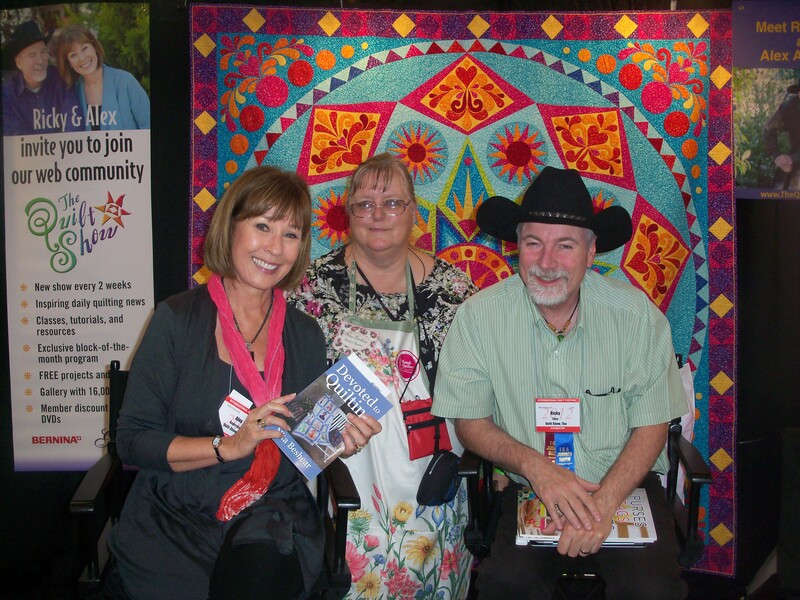 First up is the Houston Quilt Festival, since it’s the most recent event I enjoyed. The three days in Houston were great, as was the trip to and from. One of the most exciting moments of the festival was meeting Alex Anderson and Ricky Tims. Alex even purchased my book, see? Now, isn’t that a good thing to be thankful for? The Houston trip provided me much to be thankful for, I traveled with some talented, generous, gifted ladies, had a superb, fun bus driver (Thanks Dana), and saw so many quilts and quilting ideas. Including the opportunity to see one of Heather Jones‘ quilts. 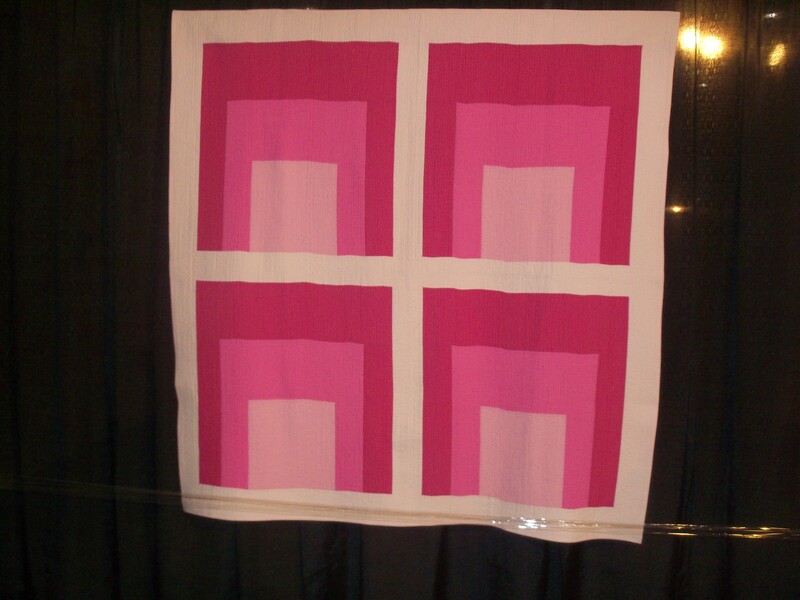 I’d seen it on her blog, but it was so much fun seeing it in person hanging with the other quilts at the show. Isn’t it cool? She told me it wasn’t an art quilt, although it looks very artsy to me. I guess it’s a modern functional quilt. Since I didn’t post my thanks for days 1-4, I’ll be adding them as the month progresses. At least, that’s the plan. Tomorrow, I’ll share my list of thirty things I’m thankful to have in my life. I liked Melissa, the Willamette Valley Wonder Woman’s idea. She listed 30 things to be thankful for, and will post them daily where she can see them to remind her of her blessings. That way, every day she will be reminded of something she’s thankful for, and will start the day in a thankful way. I will do that as well as expound on the gift here on my blog. In the meantime, what are you thankful to have in your life? This entry was posted in Devoted to Quilting, friends, fun, quilt, Quilt Show and tagged arts, aviation, Blog, bloggers, devoted to quilting, diy, friends, Home, photos, pictures, quilt show, quilter, quilting, transportation, travel on November 5, 2012 by Nita. Convert that box of scraps can be converted into a quilt (or thirty). Rather than throwing out the scraps of fabric, many quilters follow their grandmothers’ lead and make string quilts. Here are some string quilts to inspire you to put those scraps to good use. These first two are from String Quilting Primer. She and a friend joined up to give directions. They use a solid color for the base and allows it to show through. There are other quilts for your viewing pleasure on the website. In addition to the quilts on this website, she lists other string quilters. A total of 7,480 pieces of fabric including the borders. Not all string quilts are strips. Check out this one using a fussy cut print for the center of the block by Deb and shown on Quilts by Kathie. 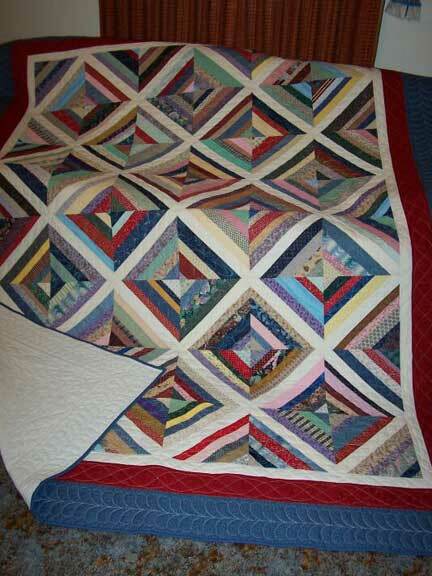 String quilts can be made using foundation fabric, ffoundation paper, or no foundation (depends on your strips). More string quilt links can be found at Heartstrings Quilts . I hope you enjoy the quilts, and maybe they inspire you to make your own. Have you ever made a string quilt? Go ahead and link to your quilt in the comments. 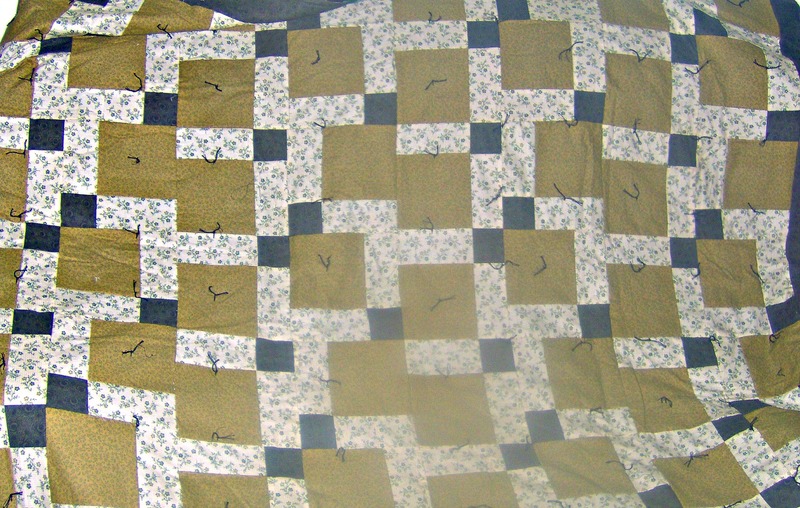 This entry was posted in 31 Days, fun, quilt, sewing and tagged arts, bloggers, chinese coins, clothing, devoted to quilting, diy, family, friends, Home, quilt, quilter, quilters, sewing, string quilts, style, tumbling blocks quilt on October 10, 2012 by Nita. Do you have telephone books, magazines, catalogs, even “real books” in your scrap pile, recycle bin or trash? Me too. I “saved” a telephone book from immediate fodder for the landfill the other day to make a tree. Much like the ones Stephanie Lynn has on her blog, using a catalog. My “book tree” is still a work in progress, and I don’t have a picture. Paperback books work well on this project also. Back when I was a kid (you know, the dark ages? ), my girl scout group made them with Reader’s Digest Magazines. More recently a friend showed me hers made from discarded paper back books. Whatever book is in your scrap pile will work. Trees aren’t the only thing books can become. The ladies over at Ashbee Design have some fun examples of other ways to decorate with books. Since I grew up in a generation of “don’t fold down pages in books,” this freedom to purposely fold the pages makes me feel a little wild. Go with your “wild side” do something fun with a discarded book, or magazine. This month I am following The Nester’s 31 Day Challenge. Over 1,000 other bloggers are participating in a link up, and have chosen to write about one topic for 31 day. As you can see, I selected “scraps.” There are some great subjects being covered over at the Nesting site, check it out. This entry was posted in 31 Days, Devoted to Quilting and tagged 31 Days, arts, bloggers, books, devoted to quilting, vacation on October 2, 2012 by Nita.